Femi-Yin claims to be able to make you feel like yourself again, so naturally, we decided to conduct some research on Femi-Yin. Rehmannia– Rehmannia helps to nourish the blood and can also assist the heart and liver. Asiatic Dogwood- This plant can strengthen the kidney and preserve fluids vital to the body. Chinese Yam- The chinese yam can improve the digestive system. Tree Peony Bark- Tree Peony Bark can help cool the blood and clears heat in the liver. 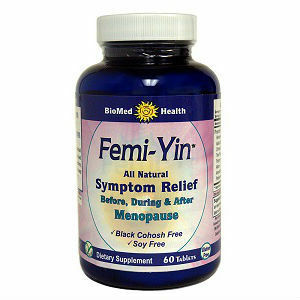 The recommended dosage for Femi-Yin is 1 tablet daily, which is nice, considering some menopausal relief formulas recommend up to 3 tablets, even twice daily. The price of one bottle of Femi-Yin is $27.99. Each bottle of Femi-Yin contains 60 tablets. One bottle of Femi – Yin will last for two months. The company the makes Femi-Yin states on their site that they offer a 30 day refund, but only on some products. They do not tell you which products though. So it is unknown whether or not Femi-Yin can be refunded. Femi-Yin makes several claims that would be quite welcomed by most menopausal women, however there are several factors about their presentation alone that will keep success away from the supplement. The products website is poorly designed and loaded with spelling and grammar errors. The product may or may not come with a guarantee, as one is mentioned but only for specific, and undisclosed, products. The ingredients are not bad, but despite their natural health benefits, are not proven to be effective or beneficent for menopausal women. Jackie Horowitz	reviewed BioMed Health Femi Yin	on November 30th	 and gave it a rating of 2.